Travel to Egypt and enjoy wide collection of our Egypt Tours in Cairo, Luxor, Aswan, Sinai and Red Sea resorts. Enjoy variety of Egypt shore excursions from Alexandria port, Port Said, Safaga, Sharm El Sheikh and Ain El Sokhna. Nile Cruise Luxor Aswan, Dahabiyas, Felucca Nile cruises and combined travel packages to Egypt and middle East. 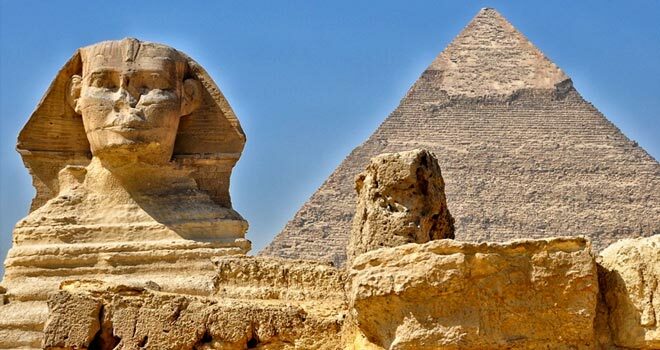 Find and book a range of Egypt top quality day Trips in Cairo, Alexandria, Luxor, Aswan, Sharm El Sheikh, Hurghada, Dahab, Taba & all around Egypt. Explore the best of Egypt with Pictures, information & travel tips. We know how to satisfy your needs & guarantee you best service with lowest rates. Egypt shore Excursions for cruise Ships calling at any of Egypt ports for a day or two whether your vessels arriving at Alexandria port, Port Said, Safaga, Ein El Sokhna or Sharm El Sheikh port. Visit Egypt famous tourist attractions in Cairo, Luxor, Alexandria, Sinai and the Red Sea coast with high quality and best price guaranteed. Discover our hot travel offers. Find & book your Egypt itinerary, extend your Egypt vacation & browse for more destinations. Enjoy travel packages to Cairo, Luxor & Aswan famous attractions, Sinai & Red sea excursions package for Sharm El Sheikh, Dahab, Taba & Hurghada featured excursions, Alexandria day & night, explore Egypt western desert with Safari & adventure programs to all Egypt oasis. The Nile Cruise is an ideal way to see the fabulous sights of Upper Egypt, It is one of the great travel experiences, Sail the majestic Nile River between Luxor and Aswan in the comfort and modern luxury of one of our 4 or 5-star Nile cruise ships, Visit some of Egypt's most famous sites aboard one of our Classic River Nile Cruise between Luxor and Aswan with very special rates & tours.